A Division III All-American in cross country in 2017, Cooper is hoping to win the New Jersey Athletic Conference title and qualify for nationals for the third straight year this season. When she first began attending The College of New Jersey in the fall of 2015, senior cross country runner Natalie Cooper was coming off an injury in the spring and was happy just to be a part of the Lions’ cross country program. Now, Cooper is not just the best runner at TCNJ, but she’s also one of the best NCAA Division III runners in the Mid-Atlantic. She is the two-time defending New Jersey Athletic Conference individual champion, a two-time qualifier for the NCAA Division III National Championships and a 2017 Division III All-American. Now, in her final college season, Cooper is looking to finish her career with a bang. At the Paul Short Invitational on Sept. 29, she finished in second place with a time of 21:15. According to the TCNJ Athletics office, it is the fastest time any TCNJ athlete has ever run at that event. Cooper decided to attend The College of New Jersey as a high school senior because she felt it was a solid fit academically. There was also a family connection as Cooper’s brother, Pierce, also attended TCNJ and played tennis there. Entering college, Cooper didn’t imagine she would eventually become an All-American. Coming off a limited training regimen during the summer of 2015 due to injury, Cooper was gradually building up her stamina in the fall. Cooper still had some success, however. At the New Jersey Athletic Conference Championships as a freshman, Cooper finished in 13th place out of 72 runners and helped the Lions to the team title. The next season was Cooper’s breakout year. After being the eighth-fastest runner on her team in 2015, Cooper emerged as a force, shaving more than a minute off her time at the NJAC championships to win the individual conference title. Cooper credited staying healthy as a big part of her sophomore success. “That summer going into sophomore year, I was finally healthy and I got a good summer of training and mileage put in,” she said. “I never thought it would turn into so many different accomplishments,” Cooper added. Cooper went on to finish in sixth place at the NCAA Atlantic Region champions to qualify for nationals for the first time. At the end of the season, Cooper was named the NJAC Runner of the Year. “I didn’t really comprehend the extent of what I was doing until later on,” she added. In 2017, Cooper had to overcome more obstacles as she struggled with a foot injury early in the season and was sidelined for a few weeks. Despite this, Cooper wanted to top her achievements from the previous season. “Personally, when I’m coming back from an injury, I want to do all of the things I’ve done before,” she said. “Once I was able to come back and I was still in good shape, I had the mindset that I won NJACs last year and I wanted to prove that I could defend that,” Cooper added. Cooper returned to repeat as the NJAC champion with a time of 21:44.19, more than 15 seconds better than second-place Alicia Belko of Richard Stockton University. In the next meet at regionals, Cooper finished in sixth place and helped TCNJ qualify for the nationals as a team for the first time since 2013. At nationals last year, Cooper finished with a time of 21:24, good enough for 28th place out of a field of 279 runners. Cooper earned Division III All-American honors for her efforts. Cooper is hopeful to make one more trip to nationals this November. 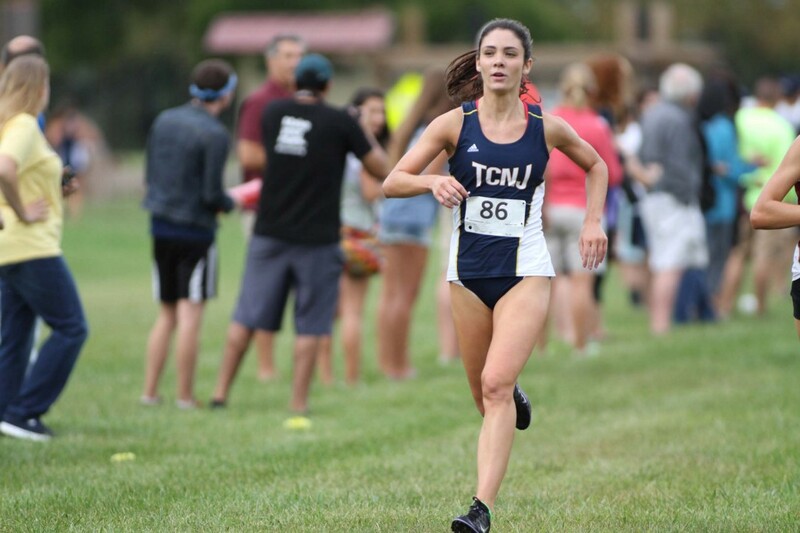 She is hoping to help TCNJ qualify as a team again, saying nationals was a more enjoyable experience last year running with her teammates as opposed to qualifying as an individual in 2016.
Cooper believes her solid performance at the Paul Short Invitational has her on the right track and she hopes to be in top shape when she tries to win her third straight individual conference title on Oct. 27. “I got in another solid summer of training, so I came in with the mindset of winning NJACs again, placing as high as I can in regionals and as high as I can at nationals,” Cooper said.